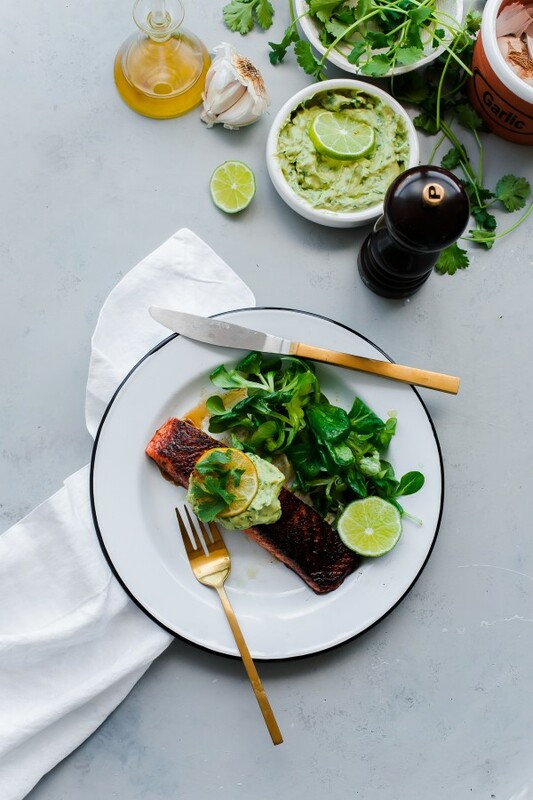 Simple and elegant brown sugar and chili-rubbed salmon with avocado crema – from Andie Mitchell’s new cookbook Eating in the Middle. Have you ever met someone that instantly feels like a very close friend? Or someone that you feel like you’ve known for years and years? It’s a great feeling, right? That is exactly how I felt the first time I met my friend, Andie Mitchell. We met for the first time back in October at a blogging retreat in Utah and spent the next three days chatting about everything under the sun, discussing our careers and insecurities, and laughing to the point of tears more times than I can count. If you’ve had a chance to read her brilliant memoir, It Was Me All Along, I’m sure you felt a similar kindredness with Andie – and with good reason. So, after practically devouring her first book cover to cover, I couldn’t wait to get my hands on her cookbook. Well, today’s the day! 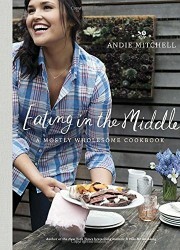 Andie’s new cookbook, Eating in the Middle, is in stores this very moment. I love this cookbook for so many reasons. Beyond the gorgeous images and comforting, yet creative and imaginative recipes – I love what this book represents. 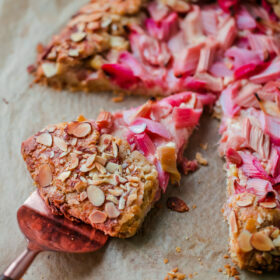 Healthy, wholesome eating with a sprinkling of indulgence here and there. 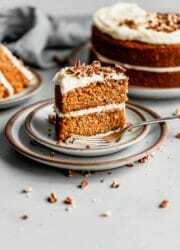 It is about celebrating life, cooking with wholesome, flavor-packed ingredients, and at the same time – forgiving and allowing ourselves to enjoy that extra slice of chocolate cake or handful of fries. The book has a little bit of everything in it and that’s why I love it so much. 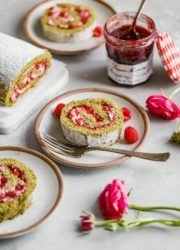 The majority of the recipes are healthy (everything is accompanied by nutritional facts), but there is also room for things like dulce de leche cream-filled doughnuts with chocolate glaze (um, yes!). In a world that often encourages an all-or-nothing attitude to food and exercise, I can’t tell you how refreshing and important this perspective is. In fact, it is this same perspective and attitude that shapes this very blog – or at least, that’s my aim and mission. 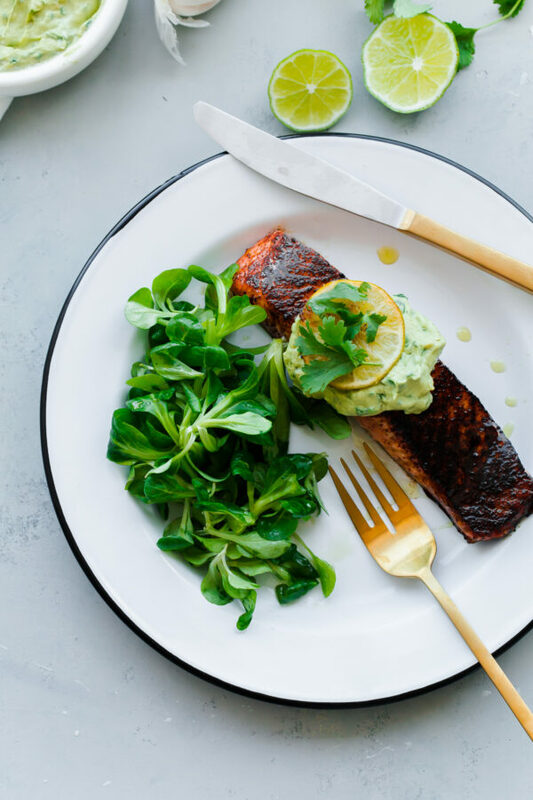 So, without further ado, let’s discuss this brown sugar and chili-rubbed salmon with avocado crema from Andie’s cookbook. I love it for several reasons. It is elegant, yet simple. It is a little bit smoky and spicy (if you want to increase the spiciness, up the cayenne pepper!). It involves avocados. It takes less than 30 minutes to prepare start to finish. And lastly, it is topped with caramelized lime slices. I mean, how cool is that? As Andie says in the headnotes, Ina Garten would be proud. 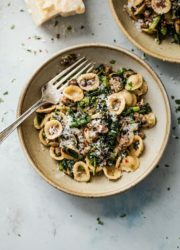 It is one of those perfect dishes that can serve double-duty as an easy weeknight dinner or as an elegant main course at a dinner party. Can you tell that I’m into it? The best part? 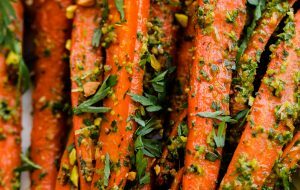 The recipe is a great starting point for so many variations. You could easily switch up the spice rub or mix up the crema. The original avocado crema called for flat-leaf parsley. I decided to use fresh cilantro instead (because I had some leftover in my fridge! ), but I imagine fresh basil or even tarragon, especially during the summer months, would work just as well. Huge congrats and hugs to Andie on this day and for this beautiful cookbook, which deserves a spot in your kitchen immediately! 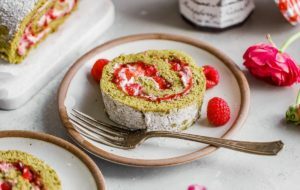 Make the avocado crema: For the cream, in a blender or small food processor, combine the avocado, sour cream, lime juice, garlic, parsley (or cilantro or basil, if using), and salt, and pulse until smooth. 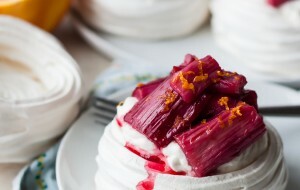 The consistency should be similar to sour cream – thick yet spreadable. To think it, add a tablespoon or two of water and pulse to incorporate. Cover and set aside until ready to serve. The crema will keep in an airtight container in the refrigerator for 1 day. 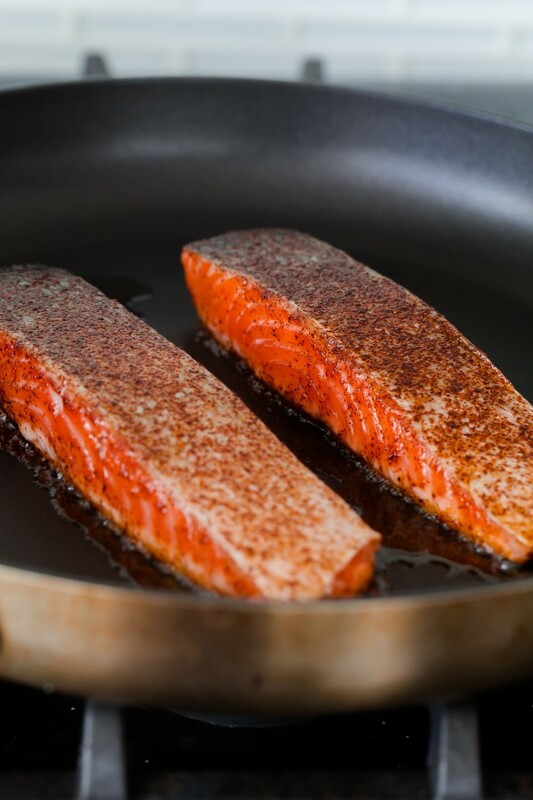 Prepare the salmon: In a small bowl, combine the sugar, chili powder, salt, and cayenne pepper. 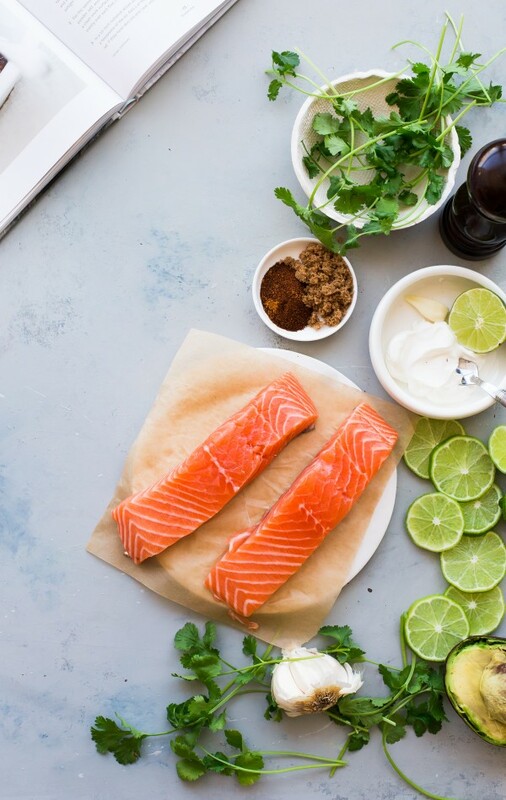 Lay the salmon filets on a clean work surface and sprinkle the brown sugar mixture evenly over each filet, rubbing it into the flesh on all sides. 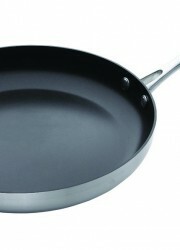 In a 12-inch non-stick skillet set over medium-high heat, heat 2 teaspoons of the oil. Add 2 of the salmon filets, skin side up, if they have skin on) and cook, undisturbed, until their undersides are crisp and just beginning to blacken, about 4 minutes. Flip the filets and cook until the fish feels firm to the touch, 4 minutes more. Transfer to a warm plate. Add the remaining 2 teaspoons of oil to the pan and swirl to coat. 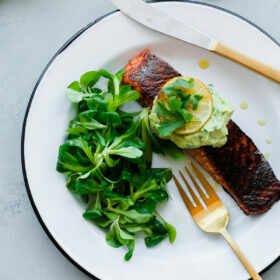 Repeat the cooking process with the remaining 2 filets of salmon. Set the salmon aside. Add the lime juices to the skillet and cook just until they begin to caramelize, about 30 seconds. Flip and cook for an additional 30 seconds. 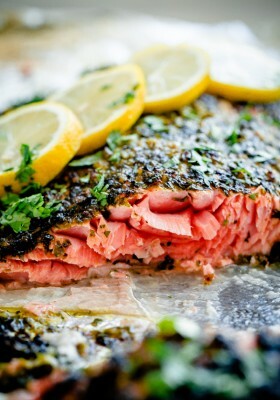 To serve, divide the salmon filets among 4 plates and spoon 2 tablespoons of cream over each. Press a caramelized lime slice into the crema to garnish and serve. This looks so good!!! I love your perspective on things, and I totally feel the same! 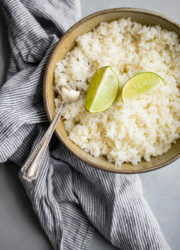 LOVE this cookbook and this recipe. I have been dying to make it ever since I laid eyes on it! 🙂 Hope all is good! I love the simple light flavors you have going on with the chili powder!! Such a great combo! 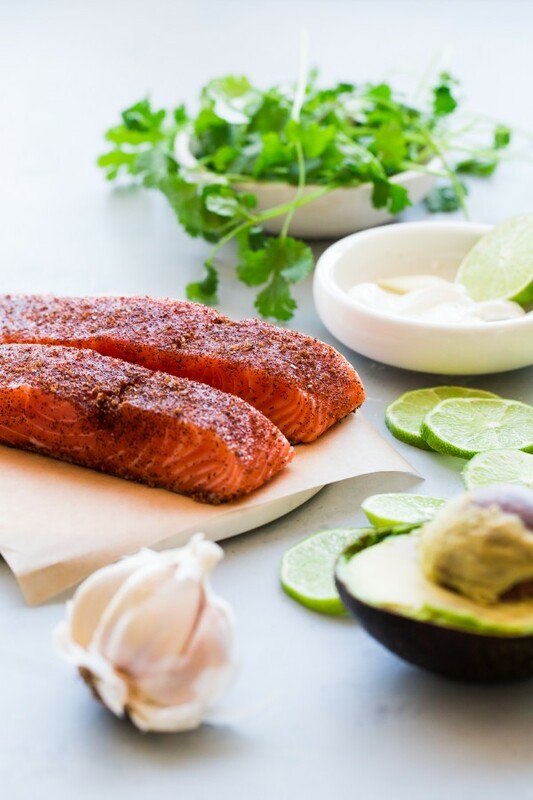 The spices sound so perfect for salmon, and I LOVE the idea of avocado crema with it! So perfect for the springtime. The book sounds wonderful!! 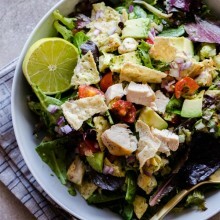 I like that perspective too 😉 Love how tasty this recipe looks! Will give it a try! Second, thank you so, so MUCH! This post is beautiful and thoughtful. It encapsulates everything I hope Eating in the Middle conveys. The photos are just breathtaking! And you just continue to make me feel so grateful for the friendship we started last October. Thank you, Laura!! YOU JUST MADE ME WANT TO CRY. WAHHHH! I’m so grateful to have finally met you in October and be able to call you a friend. You are such an inspiration to me. 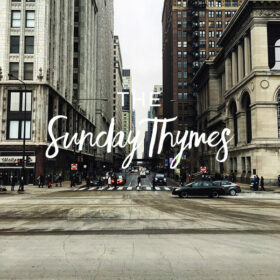 Wishing you nothing but the best – and please come visit me in Chicago. K, thanks, love you!!! Thanks so much for introducing me to Andie and her cookbook! Looks amazing… I need to get my hands on a copy! How fun to meet blogger friends at such a conference 🙂 Happy Friday Laura!